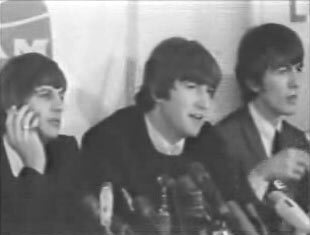 ABOUT THIS PRESS CONFERENCE: On August 18th, the Beatles returned to the States to kick off their whirlwind 1964 North American Tour -- sweeping 24 cities and giving 32 performances in just 34 days. The Beatles flight from London arrived at Los Angeles International Airport on the 18th, where the Beatles would give the first of two press conferences on this day. After traveling to San Francisco later the same evening, the Beatles would give the second press conference from the San Francisco Hilton. The first concert of the tour would be held the following night in Frisco at the Cow Palace. In the movie 'A Hard Day's Night,' John is asked by a female reporter if he had any hobbies. Although John writes his answer down on a piece of paper, the movie audience is unable see what he's written and can only see the reporters' shocked facial reaction. 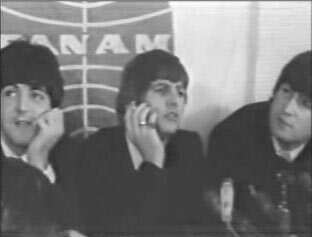 In this August 18th 1964 press conference at LAX, John Lennon and George Harrison dispell the rumors and reveal what it was that he actually wrote. The Beatles would return to Los Angeles just five days later, giving an additional L.A. press conference just before their historic performance at the Hollywood Bowl on August 23rd. Q: "What is your opinion of other groups that are patterning themselves after you?" JOHN: (jokingly) "Great! We don't know any!" PAUL: "Most of them don't. Most of them try to be different. That's the point, you know." Q: "What kind of a musical background do all of you have, before you started out?" PAUL: "Nothing. Not really. No formal education, you know." Q: "John, in the movie, somebody asks you what your hobby was and you wrote something down. What was it?" JOHN: "Crap! (spells it out) C-R-A-P."
GEORGE: "It's a dice game." GEORGE: "A dicey game, ha!" JOHN: (giggling) "You thought it was something else, didn't you?" JOHN: (comically) "You're a naughty journalist, aren't you?" Q: "Let me ask you this question. With all of the success that you people have had, what do you plan to do with all of the money that you've now made?" PAUL: "Uh, dunno really. We don't make plans." JOHN: "Great! We've got a house to go to." JOHN: "I dunno, I just made it up." Q: "How long will you be in Los Angeles?" JOHN: "I haven't a clue. I didn't even know we were here!" Q: (to Ringo) "Do you change your rings very often?" RINGO: "Never. You know, I've had these three on since..."
Q: "What do you do with rings you're given?" RINGO: "I just keep 'em in a box. you know, I sort of keep all of them." Q: "Let me ask you this question. How do you feel about all of the enthusiasm that the teenagers display?" PAUL: "We love it, 'cuz it's flattering. I mean, wouldn't you feel the same if they displayed it for you?" Q: "Does it ever scare you, all of the enthusiasm of some of the teenagers..."
Q: "But you're all traveling under such high security." PAUL: "Yeah but that's why, probably, it doesn't scare us, 'cuz we never get frightened -- we never get near to a dodgy situation, you know." Q: "Many groups have had a lot of trouble because of disputes that break out among members of the group. Do all of you get along pretty well?" PAUL: "We've been each others friends for years. A long time. Umm, you know, I knew George and John at school so, we just... we are each other's friends. So we get along." Q: "You get along pretty well." PAUL: "As well as best friends do, which is lucky. It's good. (pause) All our jokes are nearly all private jokes, as well, you know." RINGO: "I don't even know the girl. It's a load of rubbish." JOHN: "And also, I know it's in a magazine called 'Truth' about us having another baby. (yelling, comically) It's a lie! Dirty lie! (stands up and talks closely into the microphones, jokingly) I don't know what the slander laws are over here, but I'm certainly going to investigate them." Q: "The burning question is, when are you going to get a haircut?" PAUL: "Um... we do get haircuts, actually. Amazingly enough." RINGO: "I had one last night, believe it or not." JOHN: "He had one last night." RINGO: "Last night I had one. I did! It's no lie." PAUL: "But it just doesn't... You notice it when you've had a haircut but don't notice when we have. Well, sneaky haircuts." Q: "Have you heard about having a place to stay, or not having a place to stay, down here in Los Angeles?" JOHN: "Uhh, you know, we're not interested. As long as we get a bed each." FEMALE FAN: "We heard that you were all married." FEMALE FAN: (to Paul) "You're not married?" PAUL: "No, John's the only one." FEMALE FAN: "Are you just friends with Jane (Asher)?" PAUL: "Yeah. It's so corny when you say 'We're just good friends,' isn't it. But it's true." 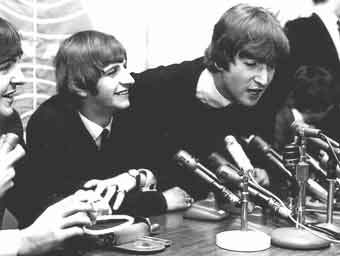 JOHN: (to the other Beatles) "The airport authorities would like to close this thing down now. (smiling to Paul) Alright?" RINGO: "Shall we say cheerio?" PAUL: (finishing his response as he stands) "But we're friends, you know, and nothing more. Walter Winchell said that we're married, but we're not." 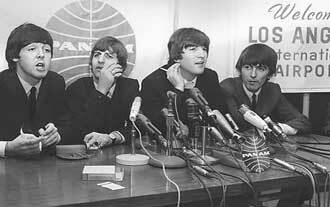 JOHN: (to the reporters) "The airport man says we've got to go!" JOHN: (yelling over the crowd noise) "Back on the 23rd for polkas and fun!!"